This sprayer is made of the finest quality material and is strong and reliable. It has an ergonomic and compact design and can be easily carried with you wherever you go. Along with the sprayer in the box, you will find one 750W turbine, a hose, and a cord. This sprayer applies 7.61 gallons per hour, which ensures easy, quick and optimal coverage. The specialty of this sprayer is that it has a built-in spray tip that is designed for professional coverage. Additionally, it has adjustable horizontal, vertical and round built-in 3-way spray control. Other features include a metal 2-finger trigger with special built-in stop feature for convenient and easy spray control along with a pressure of 14.5 PSI for minimal overspray. 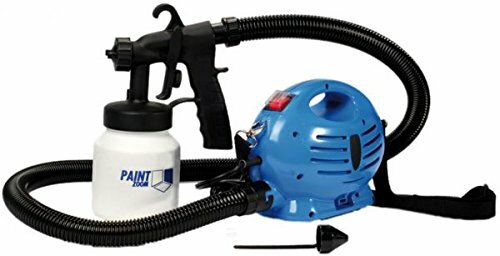 With this sprayer, you can easily apply oil paint and latex. This Paint Zoom professional paint sprayer has a compact case for storing all its tools. This case is also convenient to carry. This sprayer is also easy to clean and maintain.